Just as Dvořák’s Seventh Symphony has been sometimes dubbed the ‘Tragic’, so his Eighth might well bear the monikers ‘Poetic’ or ‘Pastoral’ such is its easeful nature in comparison to its predecessor. It was composed even quicker than the Seventh, in about 10 weeks from the end of August 1899, at his brother-in-law Count Dr Václav Kounic’s estate at Vysoká u Příbram, in Central Bohemia. Dvořák’s successes in England and elsewhere had afforded him the means to purchase a plot of land from his brother-in-law and build a country home in which to escape publishers, performers and city life in general. The full score of the symphony, completed on 8 November, bears the inscription, ‘For being admitted to membership of the Emperor Franz Josef’s Czech Academy of Science, Literature and the Arts’—an honour bestowed upon him in April 1890. Recent years had seen his fame rise and his fortune accrue and he was now as famous as any composer still alive and at work. So it came as quite a shock when Simrock offered him a mere 1,000 Marks for publication. 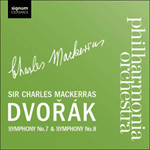 Dvořák had previously regarded the 3,000 Marks initially offered by Simrock for his Seventh Symphony as derisory (particularly after it’s great London success) and this new offer forced his hand and he instead granted the first publishing rights to the London house of Novello. A couple of months after the symphony’s premiere in Prague on 2 January 1890, he was again making his way to England to conduct the work for the Philharmonic Society. He would reprise the work at Cambridge University the following year, on 15 June, together with his Stabat Mater, as proof of his academic suitability to be conferred an honorary Doctor of Music the following day. Despite finding the amount of music enough to give him indigestion and the Latin, which dominated the academic proceedings, impenetrable, he remembered the ensuing glory as ‘quite frightening’. Dvořák’s extended stay in the United States a couple of years later brought an even greater triumph to the work when it was performed at the World’s Columbian Exposition in Chicago, on ‘Czech Day’ by an augmented orchestra of 114 to an audience of around 8,000. Back in Central Europe, the symphony was criticized by the powerful Viennese critic Eduard Hanslick as fragmentary and even by Brahms as somewhat lacking in substance. And while the work does not conform to the symphonic norms of the time, it rather takes its cue from Schumann in experimenting with sonata form and is successful in creating a whole from a rhapsodic treatment of linked melodic motifs, most notably in the opening movement. As a whole, the atmosphere speaks of Dvořák’s Bohemian countryside: bird calls, pastoral calm, happily plodding bass lines, elegant waltzes, stamping country dances, fanfares, hints of chorales or funeral marches and radiant or rip-roaring joy. 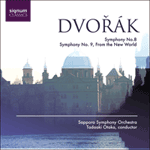 This is a symphony marking Dvořáks first venture proper into the profusion of ideas and effects that, after the Ninth Symphony, transported him to the new world of the symphonic poem.